Fibromyalgia symptoms go way beyond the chronic pain that this condition is known for. If you have been suffering from fibromyalgia, you know this well. We’re going to consider some of the symptoms that are associated with fibromyalgia, but we will also look at a natural therapy that has been able to provide relief for some patients in case studies. These cases offer hope that natural help may be possible. The 18 Fibromyalgia Trigger Points – There are 18 points on the body that are specifically associated with fibromyalgia and help to identify this pain condition since there are few diagnostic means available to doctors. Interestingly, these 18 points are found in pairs along the body, and nearly all of them are in proximity to the spine. Even the ones that are not along the spine can be related to spine issues since the nerves for these areas originate from the spinal cord and branch out. Headaches or Migraines – These are also common among fibromyalgia sufferers. Headaches and migraines are both frequently accompanied by neck pain. Migraines may also bring on an entire host of neurological symptoms such as sensory sensitivity, vision disturbances, change in mood, and vertigo. But again, there is much more to fibromyalgia than pain. Many symptoms are related to the senses. Some researchers believe that the sensory symptoms of fibromyalgia (As well as some of the pain) is related to a phenomenon in the body called central sensitization. When the body faces a dangerous situation, the senses are amped up to encourage a faster response to stimuli. For example, when you touch a hot pan, the pain is intense and causes you to let go immediately. However, the intense pain usually stops within moments after you release the pan. Sensitivity to touch – The gentle caress of a loved one may be painful during a fibromyalgia flare-up. Light sensitivity – Bright lights become painful, and even the glare from computer or mobile device screens can lead to nausea or a headache. Sound sensitivity – Both loud as well as repetitive sounds can be painful and difficult to ignore. Sensitivity to strong smells – You may even recoil from a natural scent if it is overpowering. Food sensitivities – It is common for fibromyalgia patients to have food sensitivities to things like gluten or dairy. Numbness and tingling – You may wake up with the feeling that your hands and feet are swollen, but you can tell by looking at them that there is no actual inflammation. 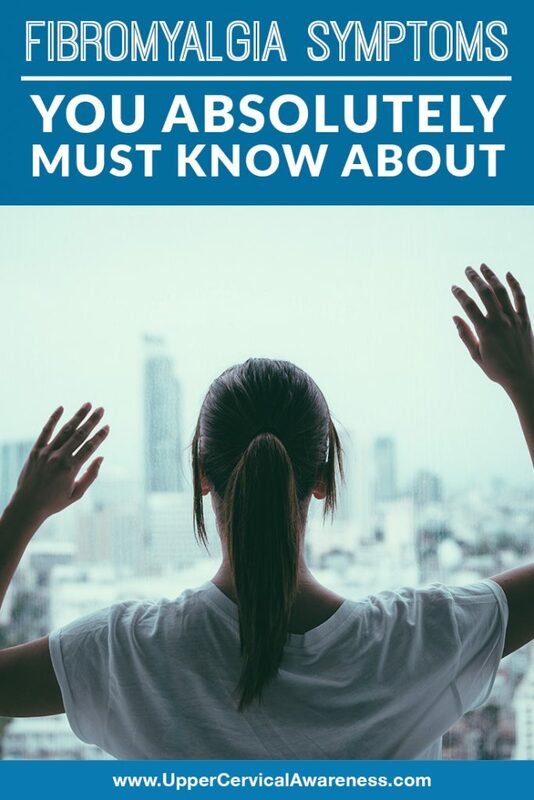 While the sensory sensitivities are enough to make you want to hide in a dark and quiet room until the flare-up ends, perhaps the most debilitating symptoms have to do with what is often called “fibro fog”. Do you find it tough to think, especially when the condition has flared up? Here are some of the fibro fog symptoms that can leave a person unable to function from day to day without assistance. This was definitely the short list of the complications of fibromyalgia. We didn’t even get to mention the gastrointestinal symptoms, the sleep problems, or the mood disorders that often accompany the pain, sensory sensitivities, and cognitive symptoms. However, the point of this article is not to remind you of all the difficulties you are dealing with. It is to show you that all of these symptoms can be related back to the alignment of a tiny bone that may affect the entire central nervous system. It is called the atlas. The atlas (top bone in the spine) is located at the base of the skull. It surrounds the brainstem and helps to facilitate the proper flow of blood and cerebrospinal fluid to and from the brain. Even the slightest of misalignments can affect the central nervous system negatively and lead to the majority of the symptoms we just discussed. Could this be at the root of your health problems? Upper cervical chiropractors have seen success in helping fibromyalgia patients. Unlike general chiropractic, there is no popping or twisting of the spine. You’re probably glad to hear that since fibromyalgia often involves a lot of neck pain. No one who is in pain wants to have their neck jerked and cracked. Plus, low-force corrections often last longer, so you can make fewer trips to the upper cervical chiropractor. That saves you money, which is also good when you probably have spent enough just getting a fibromyalgia diagnosis. If you are ready to get your life back under control, upper cervical chiropractic may offer you the natural solution you’ve been searching for. Contact a practitioner in your local area today to learn more.